Gilly Macmillan is one of my favorite authors. I enjoy her books so much that I find it very hard to pick a favorite. Macmillan consistently creates unique and riveting tales of lies, betrayals, long held secrets, and death. In I Know You Know, Macmillan portrays the long reaching and long lasting affects of crime for not only the victims, but everyone within a community. In 1996 the bodies of ten year old Charlie Paige and eleven year old Scott Ashby were found behind a dog racing track in Bristol England. The murders haunted the community long after Sidney Noyce was arrested and later convicted of the murders. When another body is found very close to where Charlie’s and Scott’s bodies were found, DI John Fletcher (who also investigated Charlie’s and Scott’s murders) is assigned to investigate the death. John cannot help but wonder if all three murders are connected. At the same time, Podcast creator and Bristol native Cody Swift has returned to conduct his own investigation into Charlie’s and Scott’s murders. Cody features his investigation on his Podcast, It’s Time to Tell. Although Sidney Noyce was convicted of the murders, there are some who doubt his guilt. While recording the Podcast, Cody meets some who would rather not relive the horrible time surrounding the murders. Cody persists undeterred and begins to unravel some very dark and dangerous secrets. My absolute favorite element of I Know You Know was Cody’s Podcast It’s Time To Tell. Charlie and Scott were Cody’s childhood best friends. He has always had doubts about Noyce’s guilt and believes the case should be reinvestigated. Cody sees his Podcast as a chance to get justice for his friends and Noyce. Cody tells most of story in It’s Time to Tell with a few interviews from others linked to the murders. His narrative actually serves as a bit of a flashback to his childhood and some of the events which occurred around the time of the murders. While reading the Podcast portions of the story, told mostly from Cody’s perspective, I noticed what he did not mention more than what he did. I found Cody a bit illusive and doubted his sincerity. For me It’s Time To Tell and Cody serve as a sort of mystery within a mystery. 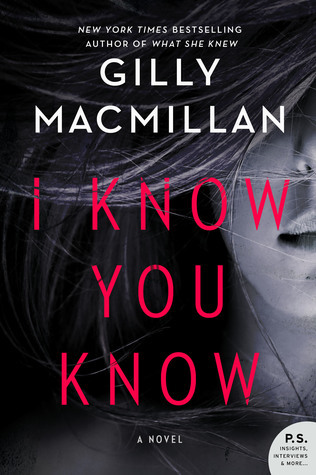 In I Know You Know Macmillan creates characters who live in the gray area of life. None of the characters are completely good or completely bad. Some of characters are behaving badly or making bad decisions to make amends for past misdeeds. Others are behaving with a “the means justify the end” attitude. This created a sort of see saw affect which lasted throughout the entire book. I never really found a character I could cheer for. When reading I am always looking for a character to cheer for, but not finding one in I Know You Know was fine. I actually enjoyed it. This was the element that made I Know You Know such a page turner for me. The story of Sidney Noyce is one which will stick with me for quite some time. Sidney is only mentioned a few times in the story, but to say his story is tragic would not do it justice. Sidney’s story is one which I have read and heard versions of many times before but it is no less heartbreaking. In each of Macmillan books she manages to really tug at my heart strings. Every book has one character who’s story stands out and I was able to see parallels with current events in the “real world” ; making Macmillan’s work not only relatable but realistic. Macmillan is truly a master story teller. She has an uncanny ability to take characters from many different walks of life and link their stories in the most captivating and suspenseful way. I Know You Know is a multi- faceted, complex read which has left me impatiently awaiting her next book.